In this SWOT analysis, Ovum Consulting concludes that organizations looking for ERP modernization will benefit from NetSuite’s cloud deployment, rapid release of new functionality and the ability to integrate with other cloud services. “The result is a fully modern suite of business applications, enabling organizations to move beyond the constraints of their legacy ERP deployment, or for first-time deployment, to benefit from an agile solution that meets the needs of a modern dynamic business”. 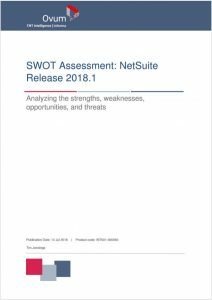 Read about Strengths, Weaknesses, Opportunities and Threats and deepen your knowledge about the NetSuite solutions and its organization.